WhatsApp is one of the most popular messaging services in the world. It is a very easy to use application which allows 2 or more users to easily communicate over WiFi or mobile data. Recent updates have now allowed voice and video calling as well, over the internet. One of the best aspects of this Facebook-owned app is that by using WhatsApp one can very easily register using his/her mobile number and all of his/her contacts are synced automatically. And it supports all the basic functionalities in a very easy to use interface. Nowadays, almost no one uses text messaging any more as data plans have become cheap and now almost everyone now uses WhatsApp. This can be judged from the fact that currently, WhatsApp has more than 1 billion active users per month. Now, many a time, users are faced with a situation where they wish to send a particular message to someone at a specific time. This can happen when you plan to wish someone on his birthday or anniversary at 12 at night but can’t stay awake till then. In such situations, one really wishes if they had the option to schedule the WhatsApp message. It would then be much easier to just write a message and schedule it to be sent automatically to the receiver at a specific time. However, WhatsApp does not have this functionality natively. But you don’t need to worry. This guide will tell you how to schedule your WhatsApp messages to be sent to someone at a specific time. If you also want to schedule text messages on Android phone, please refer to this guide. Android is one of the most popular mobile systems in the world currently with more than 80% market share. It is also very open. By open we mean, it allows a lot of customizations to be done. Users can change the complete look and feel of the operating system as per their liking and tastes. Users can also choose different apps, to be used as default apps, for any task on the smartphone. Due to this open nature of the operating system, it is much easier for us to send scheduled WhatsApp messages automatically on Android. 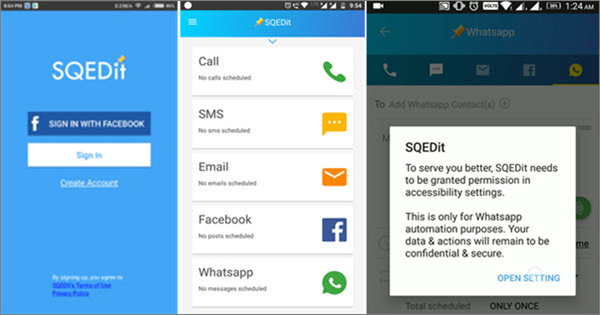 As its name suggests, this app is an app that provide the functionality to schedule your WhatsApp messages to be sent automatically at the set time to the desired person. Users can use this app to wish birthday to friends, reminds the specific work realted to WhatsApp contacts and so on. Just download and open the app. After that, it will ask you to set a passcode with hint option. Choose the person to whom you want to schedule the message. Type out the message, set the time and date, and then at last set the frequency, at which you want to resend the message if it fails to be sent for the first time. 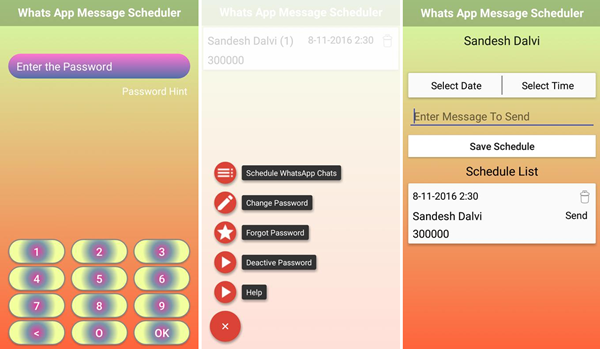 This is another Android app which helps you schedule WhatsApp messages on Android without root. You first have to enter the recipient’s name, type your message, set day and time and also the frequency at which you want the message to be sent. What’s more, you can also use this app to schedule calls, SMS, Facebook, Gmail and etc. This app directly logs in with your Facebook account and can be logged in via other social media accounts as well. It has some cool features as well as “Remind before sending”. This feature reminds you about the scheduled message before sending the message. Of course, one can install third-party apps also from outside the Play Store, or root the Android device and install rooted applications which can add scheduling functionality right into the WhatsApp app. But since the functionality works on Android without going the above route, its best to stay safe. Scheduler for WhatsApp is an easy to use app that enables users to schedule messages on WhatsApp, and users can schedule text, gif, images, or even videos to send as messages. The best part of this app is that it doesn’t require rooting your Android device. So you don’t need to hide root every time you want to play Snapchat, Pokémon Go and etc after rooting. 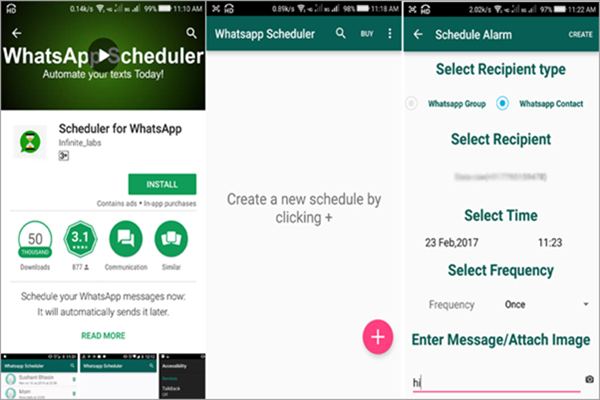 With this WhatsApp scheduler, you can set daily, weekly, monthly or even yearly WhatsApp message schedules. You can even schedule WhatsApp messages of any WhatsApp groups under the Pro version of this app. There are a lot of WhatsApp mods available on the internet. A WhatsApp mod app is a modified application in which the developers remove all restrictions, add some extra features and even add their own add code etc. 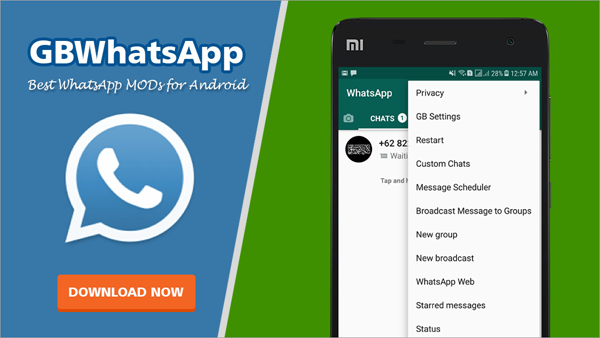 Here we will tell you about the top 2 WhatsApp mods that are popular on the internet right now. They not only help you run two WhatsApp in one phone, but also let you send automatic WhatsApp messages easily. GBWhatsApp is the most common and popular mod app designed to access WhatsApp with more features. It provides many features more advanced than the official WhatsApp application. Here are the steps to use Message Scheduler of GBWhatsApp. Download the GBWhatsApp Apk and install it on your Android device. Now, open the app and enter your phone number to log in to your WhatsApp account. Tap on the top right corner, and click on “Message Scheduler” to open it. You will get the scheduler opened on your screen. Now, tap on the “+” button to add your own schedule. Add your new schedule by filling up the details given. Then, tap on “Schedule”. 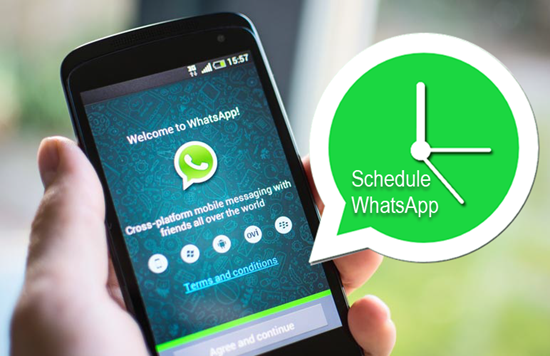 In this way, GBWhatsApp can be used to send a scheduled WhatsApp message through Message Scheduler. 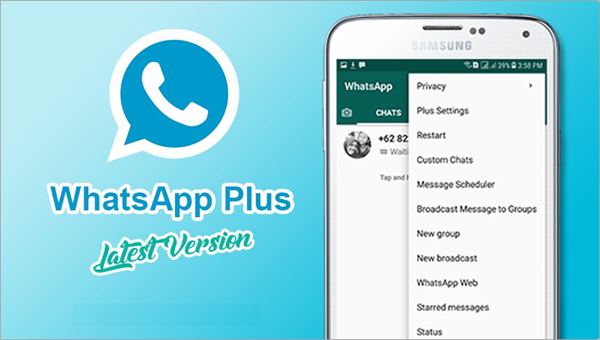 WhatsApp Plus is the modded app which has more advanced features to explore than the original WhatsApp. This version provides more stability to the user’s security. Using WhatsApp Plus, the user can hide the last seen, typing status, blue tick, change group settings and many more. Moreover, you can also access two WhatsApp account on the same Android device using this modded version. Most importantly, WhatsApp Plus also provides the feature to schedule the message of WhatsApp. Download and install the WhatsApp Plus app on your Android smartphone. Now go to Tools -> More Option -> Schedule. Then, add your message and provide the app with the start date and time. Hence, your message is scheduled with the Message scheduler of WhatsApp Plus. If you have any queries related to Message scheduling then you can put your doubts and questions in the comment section below this article. Apple’s iOS system is famous for its walled garden approach. Users are pretty much restricted to make major changes in the way they can use the operating system. That includes the usage of stock apps for basic tasks. One cannot set default apps for specific tasks on the operating system. Though over the years, Apple has loosened its restrictions, it still is very strict on what it allows users to do out of the box. It is due to these restrictions that natively, it is not possible to schedule a WhatsApp message on iPhone. There is a paid app in the Apple App Store that says it schedules messages but basically sets a reminder for you to send a message at a set time. There is no need spending money on this app as such a reminder can be set in Apple’s reminder app as well. It doesn’t serve the actual requirement of hands-free sending of messages at a particular date and time. The only way to achieve this functionality on iOS is through jailbreak. 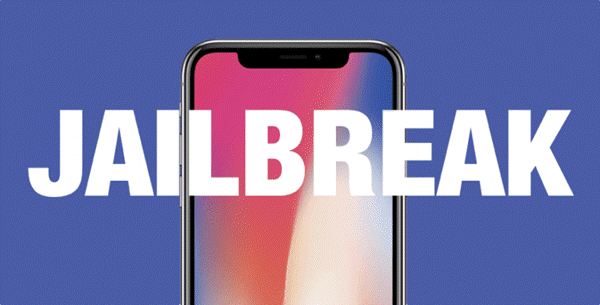 If you have a jailbroken iPhone or don’t mind jailbreaking your device, then there are a few tweaks you can install from Cydia marketplace and then achieve this functionality on your iDevice. 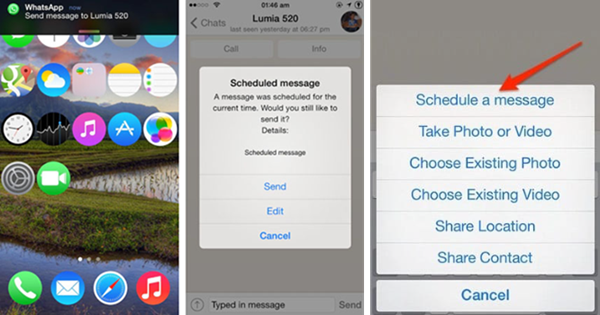 Here we recommend you “Message Scheduler for WhatsApp“. This tweak bakes in the scheduling functionality right into the WhatsApp app for easy access. It has no settings to configure after installation. It works by adding a button titled “Schedule a message” to the message menu in the main WhatsApp app. One can simply tap this option inside the WhatsApp app and choose the date and time when message delivery is desired. Messages can also be scheduled, using this tweak, by long pressing the send button when entering message text. WhatsApp will confirm scheduled message sending when the correct time arrives. Step 1. On a jailbroken iPhone, install Message Scheduler for WhatsApp from Cydia. Step 2. Open the official WhatsApp Messenger on your iPhone, and then select the person who you want to schedule the messages to. Step 3. Then type the messages and long press the “Send” button, and then hit “Schedule a Message” in the popup window. Step 4. Finally, set the date and time for when to send the scheduled WhatsApp messages automatically. That’s it, you are done! Your WhatsApp messages will be sent at the scheduled time. We hope this guide will be helpful to you in scheduling your WhatsApp messages on your iPhone/Android phone. 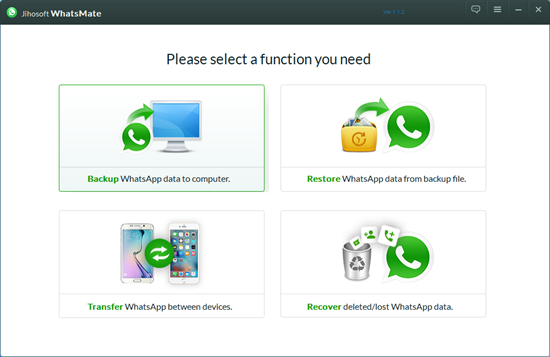 And every piece of WhatsApp messages we sent or received comes with golden memory, so remember to use this Jihosoft WhatsMate to backup your WhatsApp chats to computer without charge so as to keep them safe with you.